For the past few years, I’ve been drooling over kayaks. I can’t explain why or when the fascination occurred, but one of my priorities every summer for the past few has been trying to figure out which kayak to get eventually. I knew it had to be something light, durable, and able to handle a pretty wide variety of adventures. Ponds? Yep. Lakes? Probably. Long overnight river trips? Uhm, yeah! Some mild whitewater? Heck yes. Over time the list (which was once well over 30 kayaks long) was shortened to 2: Dagger Zydeco 9.0 and Dagger Zydeco 11.0. Why? Well, Dagger is just one of those brands synonymous with “our products can take a beating”. While other kayaks I had looked at would be have been ideal for ponds and the occasional branch run in at coasting speeds, Dagger screamed river runs, long trips, and learning curve acceleration. In the end, it was a no brainer. Finally in June, I got my kayak – a stunning lime green Zydeco 9.0. It was love at first sight. So far, we (Rob snagged himself a Zydeco 11.0) have only put about 30 miles on our kayaks but with each outing, the kayaks get better and better. A quiet section of Lake Massabesic. We’re hard to miss, huh? I don’t know much about the folks who design these kayaks, but I can tell you that they thought of almost (I’ll get to that) everything when designing these water beasts. From material choices to features, design, and style – these kayaks are fantastically well rounded. 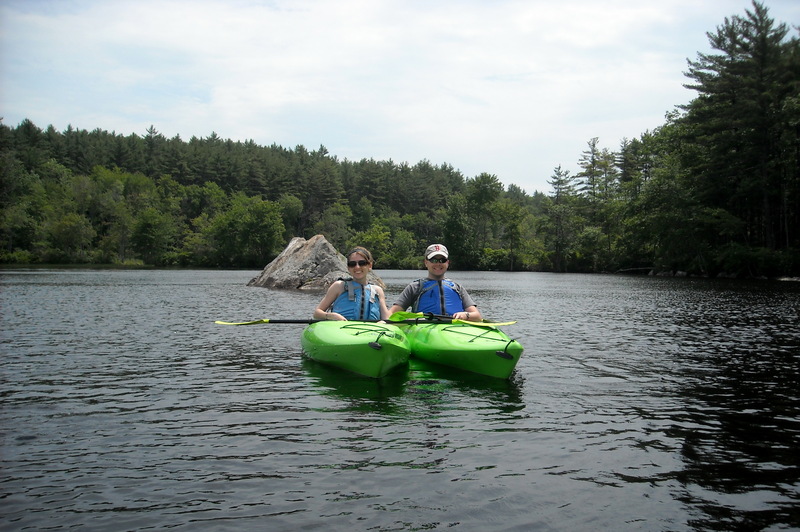 Soon after getting our kayaks we took them out to one of the largest lakes in Southern New Hampshire, Lake Massabesic. 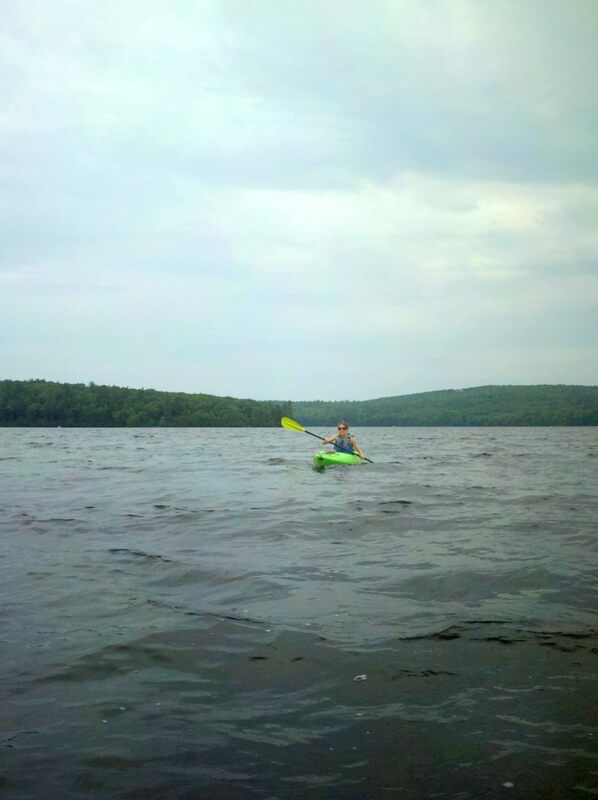 While most lakes are beautiful and flat, Lake Massabesic is one of those lakes that’s just notoriously windy and wavy. I had been out there before in other kayaks and found myself all too often spinning in miserable circles thanks to the elements, but with my Zydeco – piece of cake. Also happy to say that my Zydeco handled the incredibly large waves of Lake Winnipesaukee really well too! And our favorite excursion of all? 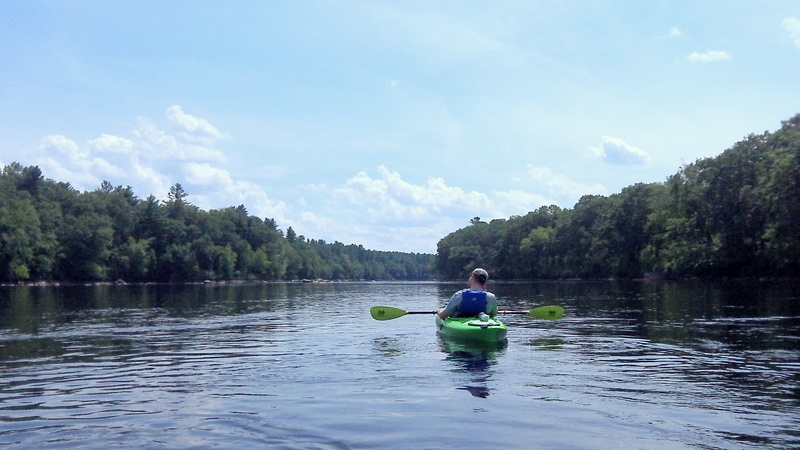 Most recently we took our Zydeco’s out for a short trip on the Merrimack River. I’m stoked to say that both Zydeco’s handled some mild whitewater fantastically well. Where other kayaks would have almost certainly spun and/or tipped, the Zydecos cruised right through responding to our every stroke. Needless to say, I’m pretty excited to get my hands on a kayak skirt and try something a little harder! Rob enjoying a quiet section of the Merrimack River with his Zydeco 11.0. The Zydeco 9.0 is 9′-1″ long and has a width of 28.5″. While the width may be a little more than I was aiming for initially (I was ideally going for 24″ or less), the extra room has proven fantastic for stability and stretching. Maximum capacity is 220lbs and I can verify that anything over that will definitely make for a rather miserable journey (let’s just say I tried ferrying a cooler and a person on Lake Winnipesaukee – didn’t work). The kayak itself weighs 36.5lbs and is surprisingly easy to maneuver around on dry land as a small female. The Zydeco 11.0 measures in at 11′-2″ long with a width of 27.75″. Rob has appeared incredibly comfortable in his kayak, so it seems the width and cockpit dimensions are working out nicely for him. Maximum capacity is 325lbs, and we haven’t even come close with this kayak. We did notice though that it’s definitely important to pack your kayak as evenly as possible when on long trips. Don’t put all the heavy stuff in the hatch! The kayak itself weighs in at 48lbs. It’s definitely a bit easier to handle on dry land with someone else, but still doable by yourself. As for features, we’re loving a lot of things. When it comes to everyday usage, Dagger put a lot of thought into comfort and allowing individuals to customize their kayak to fit. Among those features are the “Comfort Fit Seating” system and the SlideLock foot brace system. Both make any length trip better. When it comes to travel, Dagger made sure that these kayaks could carry it all. Between the bungee deck rigging, ample room in the bow and stern, and the watertight hatch on the Zydeco 11.0, you’ll have a hard time running out of room. I’m hard on gear and won’t be shy about saying what needs to be improved, but overall I only have 2 very small gripes about the Zydecos. There’s a cupholder… under the seat. Why? I’d love to at least see something made to hold a water bottle from sliding all over the place. Perhaps on the back of the seat? It is a royal pain to drain the Zydeco 11.0 as there is no drain plug (there’s one of the Zydeco 9.0). It would be all sorts of fantastic to see one on of the 11.0! Overall, these kayaks are fantastic. If you’re looking for your first kayak or are planning to upgrade – both the Dagger Zydeco 9.0 and the Zydeco 11.0 are sure to promise many adventures. Paddle on! Great review! I’ve been searching for the right kayaks for me and my partner for months and the Zydecos seem to be perfect! We live in Ireland and our plan is to take them down the length of the River Shannon (224 miles) next summer. I did the trip in my Canadian canoe a few years ago and ever since, I have been dreaming of doing it in a kayak with ultralightweight and compact camping gear. We would also like to do the Rivers Liffey, Barrow, Slaney and Blackwater and, as these have a number of weirs and some whitewater, we think the ‘crossover’ style Zydecos would be perfect! I can’t wait to try them out! Happy adventures! Sounds awesome, Carl! My husband and I absolutely love our Zydecos and we’ve put a lot of miles and trips on them now. Absolutely no regrets! I’ve also been thinking of doing a very long river trip at some point (217 miles), so I’d love to hear how your trip goes! Thanks for writing such a great review! I have a 2005 Zydeco 9′ and LOVE it. Like you, I’ve had it in choppy, windy lakes (waves crashing over the bow! Exciting times!) Some Rapids, have run over rocks and tree limbs and it’s been a champ! It’s tough and moves right along when I need it to. Since having moved to southern CT recently, I’ve found myself surrounded by lakes and rivers and ocean and have decided to buy a second kayak for my husband to use. I’ve been looking at the Zydeco 11′ and discovered that, aside from length, it’s dimensions are the same as my older Zydeco 9′ (which is actually 9’5″ and the same width as the current model 11′.) So I’m excited to hear that the newer models are just as good. Definitely go with the 11′ if you’re getting a second kayak. We’ve done plenty of longer journeys in our kayaks and having the extra space in one of them has been wonderful. I usually end up carrying the bigger dry bags while my husband takes the little stuff and loads up the dry hatch with the odds and ends. Works perfect! I’m sure your husband will enjoy everything about it! Happy kayaking! I bought my Zydeco 11! I’ve only taken it out once, but so far it seems almost identical in performance to my older 9′ Zydeco. I’ve got a question about your 11. Have you noticed any flex to the bottom of your boat when it’s in the water? I noticed on mine that after a couple of hours on the water that it started to budge in the flat area in front of the seat. I could put my foot on it and push it down, but it was a bit unnerving and thought I’d see if other Zydeco owners noticed that occurring on theirs. I called Dagger about it and they said it may not have enough plastic in that spot, so I’m taking it back to the dealer and possibly exchanging it for another. Oh, that’s strange! We’ve never had any problems like that with either of our Zydeco’s, so I’d definitely see about exchanging it for another. I’m sure it was just a one off product defect! Glad both Dagger and the dealer were able to help you. Fortunately the weather isn’t *really* kayak worthy yet, so it’s better to be dealing with this now instead of once warm weather hits! Happy kayaking! Mike – I haven’t run into any issues myself and we’ve been using the Zydeco 11 since mid-2013. I’ve also checked out several other Zydeco’s at trade shows, stores, etc. and haven’t come across the thin plastic issue. I hope it’s just an issue that affecting a very select few of Zydecos, but I’ll agree it’s concerning. Let me see if I can reach out to Dagger and get some clarification. I get a lot of traffic to this article and I’d obviously like to make sure thin plastic isn’t the new norm. I’ll get back to you!